Houses & Homes VA: Vinegar is not the Only Super Cleaner in Your Home! Vinegar is not the Only Super Cleaner in Your Home! Now you know why many of the dish liquids on the market advertise lemon as one of the ingredients in their product. Lemon is fantastic at dissolving the built up soap scum in your bathroom and works equally well on tarnished brass and copper. It is also a natural stain remover for dishes as well as fabrics. I suggest cutting a lemon in half and using it as a built in sponge! This will do the trick for almost any stain and when you’re done you can dispose of it in the disposal to leave a nice fresh smell in the sink. I’ll bet you didn’t know that olive oil is the best way to remove all of that built up “stuff” on cast iron pans when mixed with just a touch of salt. Be sure to use hot water. It will also clean stainless steel to a diamond like sparkle. Here’s one that I just learned recently: You can use olive oil to clean and eliminate those little scratches on your leather furniture! Now that is a trick worth knowing. Believe it or not baking soda cleans just as well as vinegar. It’s good for removing stains as well as cleaning the usual kitchen appliances and counter tops. You can also use it to eliminate nasty odors in shoes, trash cans and the like. This is one of my favorite smells! I like to soak some cotton balls in vanilla and place them around the house for that relaxing and clean aroma. It’s a great idea for those musky closets, the garage, the bathroom and even the living room. Don’t be surprised if the kids ask you where the cookies are! Vinegar is a great fabric softener. Yep – a fabric softener! That’s nice to know if you find yourself washing laundry at 3 am and run out of those dryer sheets. (I’ve actually done that). Finally a word of caution when using vinegar to clean – NEVER use vinegar on marble. The finish on marble just doesn’t work well with vinegar and can actually become ruined over time. 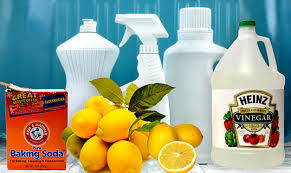 Aside from that (and the smell) vinegar is still and excellent choice for many household cleaning chores.